There's no lack of people out there telling you to find your passion and dream big. But why does it seem like when we try, we so often end up more lost and overwhelmed than when we started? Liz Forkin Bohannon wants you to rethink everything you've been told about finding your passion and following your dreams. Why? Hate to break it to you, but you're likely never going to "find your passion." Because your passion and purpose are something you build--actively--day by day. In her signature tell-it-like-it-is fashion, Liz shares 14 actionable principles that will teach you how to do just that. With total transparency, Liz shares hilarious and heartbreaking stories of her journey of screwups and successes that illustrate the mindsets and principles that will give you a jolt of energy, inspiration, and direction toward your True North. 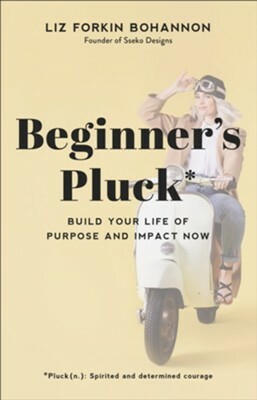 By embracing your Inner Beginner, dreaming small, choosing curiosity over criticism, and so much more, Liz's story and the principles of Beginner's Pluck will have you on your way to building a life of purpose, passion, and lasting impact. Ready to rise to the occasion? It's time to make this life everything you want it to be. Liz Forkin Bohannon is a speaker, an entrepreneur, and the founder of Sseko Designs, an international purpose-driven fashion brand creating employment for women across the globe. Recognized in 2017 by Forbes as a top public speaker and named by John Maxwell as one of the top three transformational leaders in the US, Liz has appeared on Shark Tank and Good Morning America and has been recognized by Bloomberg Businessweek, the Cartier Women's Initiative Awards, the Bush Institute Global Women's Award, and others. She lives with her husband, Ben, and two young sons in Portland, Oregon. I'm the author/artist and I want to review Beginner's Pluck: Build Your Life of Purpose and Impact Now - eBook.